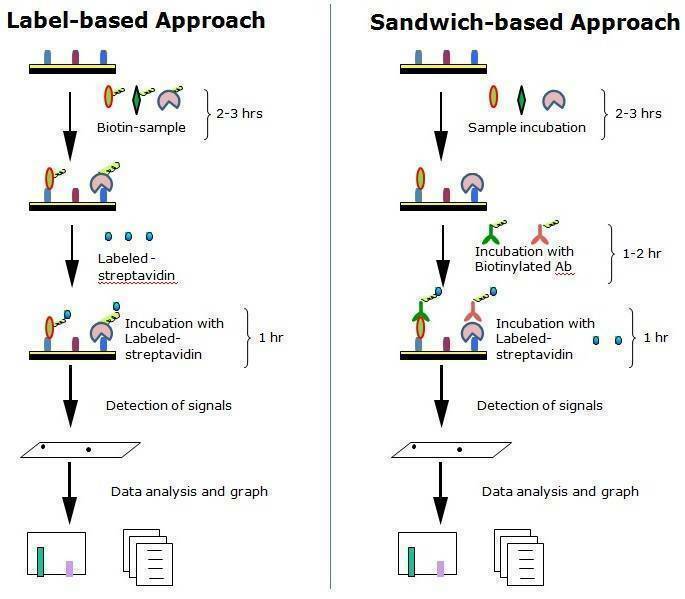 Detection of binding partners for 100 different glycans in purified proteins, serum, plasma, cell culture supernatants, cell/tissue lysates or other body fluids. Glycocalyx, literally meaning ‘sugar coat’, is an extracellular polymeric coating surrounding many prokaryotic and eukaryotic cells consisting of glycoproteins, glycolipids, proteoglycans and glycosaminoglycans. The constituents of the glycocalyx play an important role in the process of cell signaling, virus infections, and immunity. 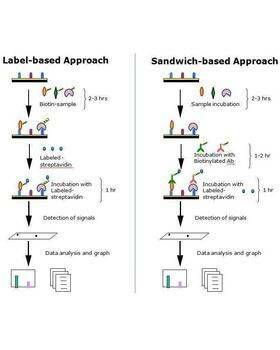 However, detection tools for the research of glycobiology are currently in very limited supply. Upon receipt, all components of the RayBiotech Glycan Array 100 kit should be stored at -20°C. After initial use, remaining reagents should be stored at 4°C to avoid repeated freeze-thaw cycles and may be stored for up to 3 months (Labeling Reagent, Item B, should be prepared fresh each time before use). Unused glass slides should be kept at -20°C and repeated freeze-thaw cycles should be avoided (slides may be stored for up to 6 months). The entire kit should be used within 6 months of purchase. Amonsen, M.; Smith, D. F.; Cummings, R. D.; Air, G. M. J Virol 2007, 81, 8341-8345. Paulson, J. C.; de Vries, R. P. Virus Res 2013, 178, 99-113. Stencel-Baerenwald, J. E.; Reiss, K.; Reiter, D. M.; Stehle, T.; Dermody, T. S. Nat Rev Microbiol 2014, 12, 739-749. Park, S.; Shin, I. Org Lett 2007, 9, 1675-1678. Pourceau, G.; Chevolot, Y.; Goudot, A.; Giroux, F.; Meyer, A.; Moules, V.; Lina, B.; Cecioni, S.; Vidal, S.; Yu, H.; Chen, X.; Ferraris, O.; Praly, J. P.; Souteyrand, E.; Vasseur, J. J.; Morvan, F. Chembiochem 2011, 12, 2071-2080. Laurent, N.; Voglmeir, J.; Flitsch, S. L. Chem Commun 2008, 4400-4412. Xu, R.; de Vries, R. P.; Zhu, X.; Nycholat, C. M.; McBride, R.; Yu, W.; Paulson, J. C.; Wilson, I. A. Science 2013, 342, 1230-1235. Xu, R.; McBride, R.; Nycholat, C. M.; Paulson, J. C.; Wilson, I. A. J Virol 2012, 86, 982-990. Stevens, J.; Chen, L. M.; Carney, P. J.; Garten, R.; Foust, A.; Le, J.; Pokorny, B. A.; Manojkumar, R.; Silverman, J.; Devis, R.; Rhea, K.; Xu, X.; Bucher, D. J.; Paulson, J. C.; Cox, N. J.; Klimov, A.; Donis, R. O. J Virol 2010, 84, 8287-8299. Stowell, S. R.; Arthur, C. M.; Mehta, P.; Slanina, K. A.; Blixt, O.; Leffler, H.; Smith, D. F.; Cummings, R. D. J Biol Chem 2008, 283, 10109-10123. Stowell, S. R.; Arthur, C. M.; Slanina, K. A.; Horton, J. R.; Smith, D. F.; Cummings, R. D. J Biol Chem 2008, 283, 20547-20559. Carlsson, S.; Oberg, C. T.; Carlsson, M. C.; Sundin, A.; Nilsson, U. J.; Smith, D.; Cummings, R. D.; Almkvist, J.; Karlsson, A.; Leffler, H. Glycobiology 2007, 17, 663-676. Hwang H., Han J., Kim G., Han J. Functional Expression and Characterization of the Recombinant N-Acetyl-Glucosamine/N-Acetyl-Galactosamine-Specific Marine Algal Lectin BPL3. Mar Drugs. 2018 Jan 5;16(1). pii: E13. doi: 10.3390/md16010013. Dan X., Liu W., Ng T. Development and Applications of Lectins as Biological Tools in Biomedical Research. Med Res Rev. 2016 Mar;36(2):221-47. doi: 10.1002/med.21363. McCombs J., Diaz J., Luebke K., Kohler J. Glycan specificity of neuraminidases determined in microarray format. Carbohydr Res. 2016 Jun 16;428:31-40. doi: 10.1016/j.carres.2016.04.003.